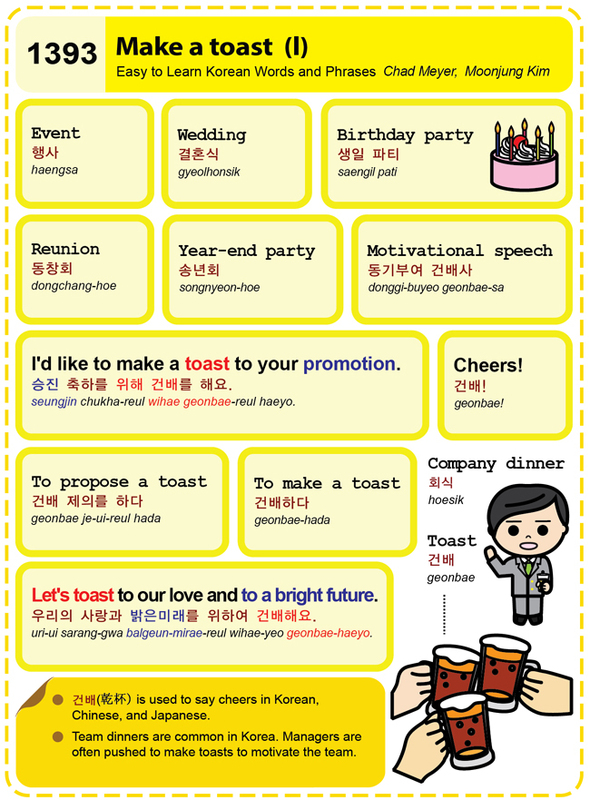 Easy to Learn Korean 1393 – Make a toast (part one). This entry was posted in Series and tagged birthday party, cheers, company dinner, event, I'd like to make a toast to your promotion., Let's toast to our love and to a bright future., manager, motivate, motivational speech, reunion, team dinner, To propose a toast, toast, wedding, Year end party, 乾杯, 건배, 건배 제의를 하다, 건배하다, 결혼식, 동기부여 건배사, 동창회, 생일 파티, 송년회, 승진 축하를 위해 건배를 해요., 우리의 사랑과 밝은미래를 위하여 건배해요., 행사, 회식 by easykorean. Bookmark the permalink.